Zombie-loving kids rejoice! 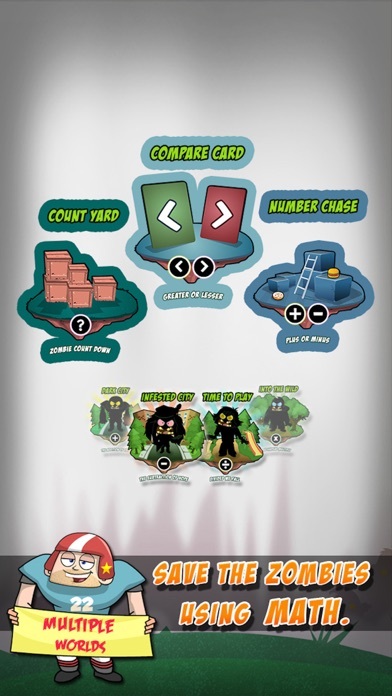 Math Vs Zombies 2 gives kids a way to get their fill of zombies while building their math skills at the same time. This isn’t your typical blood and guts, brain-eating zombie app. Instead, kids will encounter cartoonish zombies who love to eat donuts and other sweets. Correctly solving math problems, involving a range of skills, such as addition, subtraction, and greater than/less turns the zombies back into adorable children. The more problems solved, the more kids saved. 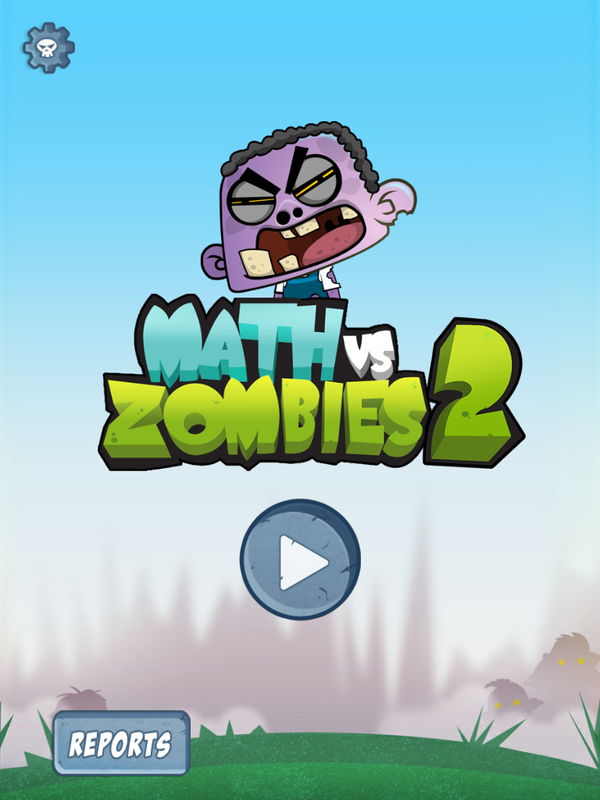 Math Vs Zombies 2 definitely has the feel of an eerie zombies app. As kids navigate through the app, they’ll encounter mysterious background music, random screams, and spooky zombies. Rather than being scary, however, the whole app is a bit comical and cartoonish, making ideal for a wide age range and perfect for kids who want to interact with zombies, but are typically scared of the whole creepy Halloween scene. The quality of the app extends to the games, which are clearly organized by skill and by level, making it easy for kids to find the skill they want to practice and track their progress as they complete levels. 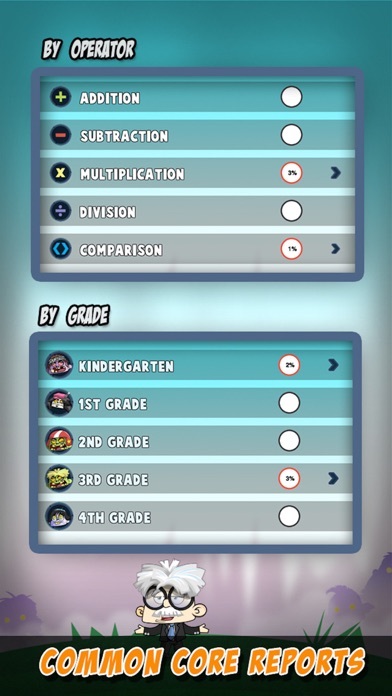 Inside the app, kids will find 7 different skills and 84 different levels. Skills covered include basic counting, greater than/less than, addition, subtraction, plus or minus, multiplication, and division. 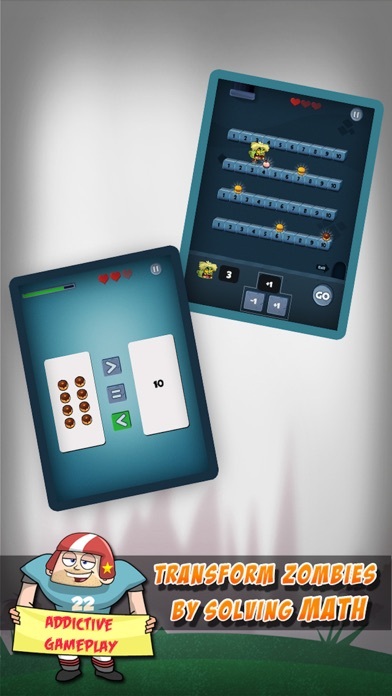 Kids start on level one of each skill and the problems increase in difficulty as they advance through the levels. Parents and teachers will appreciate the report card feature which allows them to quickly see a kids’ progression by skill and grade-level, tracking their performance based on Common Core math standards too. A special parent section also gives adults suggestions for how to use the app with kids. 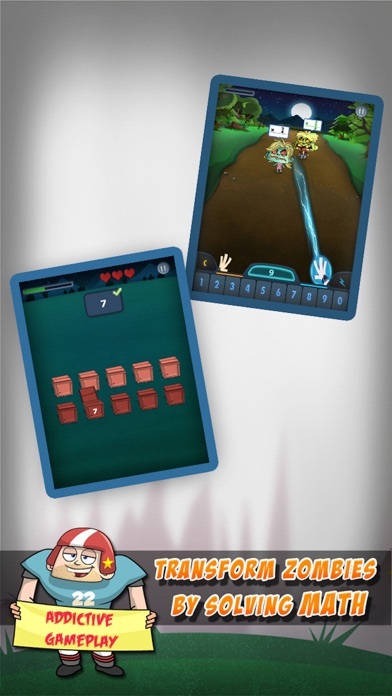 While the app offers 7 different skills and multiple levels, many of the games are the same. Kids will love changing the zombies into kids by answering questions, but they will probably get a bit bored if they play the game for long periods at a time. In most of the games, kids just answer questions and zap zombies as they walk along a road. It’s a lot of fun, but can get repetitive after a while. 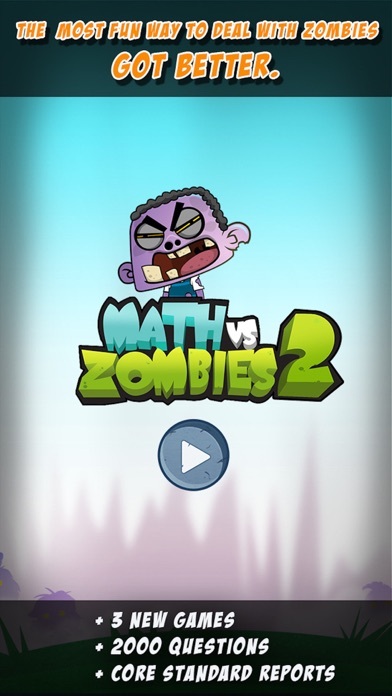 Math Vs Zombies 2 covers a wide range of grade levels and skills. Designed for ages 5-11, kids even younger than 5 and older than 11 may also benefit from the app. Add to that the ability to track kids’ progress based on individual skills and with regard to the Common Core standards and the app offers a lot of value. Despite that value, it still comes with a pretty high price tag. Some parents may be hesitant to let their kids play a game involving zombies, but this game is less scary zombies and more fun, cartoonish zombies. The zombies don’t seek out people and attempt to eat their brains. Instead, they’re adorable child zombies that can’t wait to be zapped and turned into even cuter little kids. Beyond the zombie aspect, the game is very child friendly, keeping kids focused on the games and using a parental block to keep them from accessing parent information.